Something for the heart … and for the feet. Not only artists have been inspired since time immemorial by the view from the classic mountain. People like us are also captivated over and over again by the setting. Alone the ascent with the red funicular is a show. For over 100 years it has climbed up the steep slope and is the second oldest mountain railway in the Graubünden region. Some come to enjoy and have a feast, while others want to hike into the panorama, either down to Pontresina or up to the Segantini Hut and Schafberg, where the famous Italian painter Giovanni Segantini died in seclusion. Come and see for yourself just how amazingly precise this sundial is! Following the trail of the famous artist takes you to one of the most beautiful vantage points in the Upper Engadin. Following the tracks of the ibex: from Alp Languard to Pontresina. The place from where Segantini drew his inspiration – and where the climate is leaving its mark. A brief journey of inspiration. 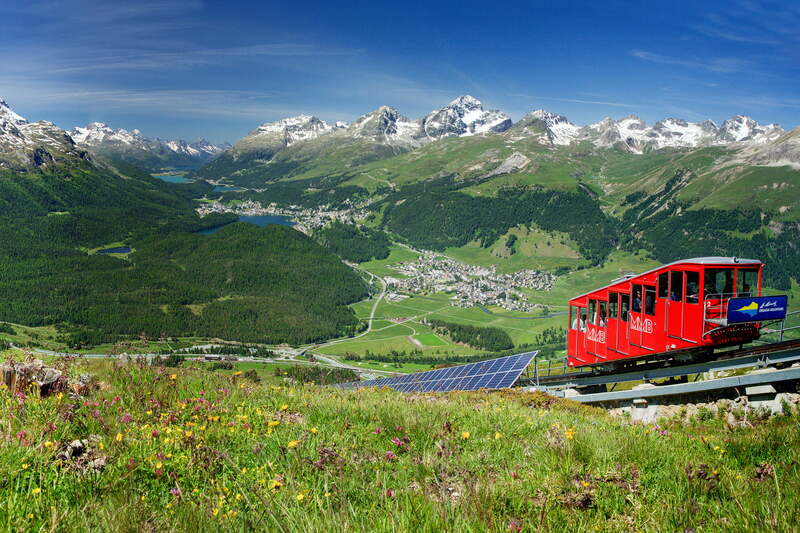 First plus-energy hotel in the Alps: guided tour for groups. Discover more about the ground-breaking energy concept implemented by the Romantik Hotel.